Organic, Non-GMO, Fair Trade, cruelty-free, and earth-friendly products are available throughout the store. See Farmers & Producers and our Purchasing Mission & Guidelines for more information. 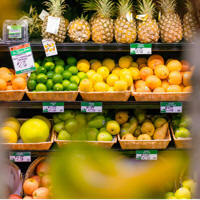 The Co-op offers the best selection of fresh, local and organic produce in the area. Supporting local fruit and vegetable farms is our goal at Keweenaw Co-op. Due to our short growing season, our partnerships with regional sources enables The Co-op to provide fresh produce to our customers. Fresh local produce is delivered daily in season and we offer many organic choices throughout the year. Our knowledgeable and friendly Produce Crew is always available to answer your questions and help you find the freshest produce to keep you feeling your best. Are your kids Co+op Explorers? Learn more about our free fruit program for kids ages 12 and under. Purchase a pinch or as much as you need in the bulk foods department. Select from nuts, seeds, dried fruits, nut butters, pasta, granola, oils, grains, spices…even soaps and shampoos. Buying in bulk saves you money and reduces wasteful packaging. Shoppers are welcome and encouraged to bring their own containers. 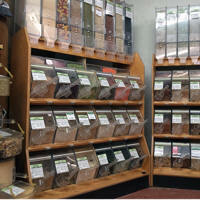 Check out the newest edition of The Co-op's Bulk Department, a beautifully organized bulk spice rack. Pad Thai at home? South American brunch? Sushi Party? Select from a wide variety of global and gourmet food items to help you prep any cuisine you desire. The best Deli in town offers healthy, fresh, organic, vegan/vegetarian meals, sandwiches, soups and salads all prepared on premises by our expert cooks. We have the only "Juicer" in the four county area. It's worth the trip for the best brain food in town!!! A variety of local, organic, free-range, fresh and additive-free meats. 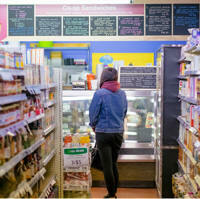 If you are looking for an alternative to meat the Co-op carries tofu, seitan, tempeh, veggie burgers, veggie dogs and other vegetarian options. Enjoy organic and flavorful foods while maintaining a special diet. 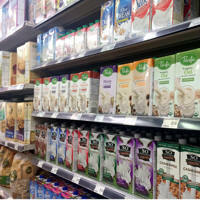 Find a selection of wheat-free, gluten-free, lactose-free and other allergen-free foods throughout the store. If you have questions or have specialty food requests, don't hesitate to ask our knowledgeable and friendly crew to help you. 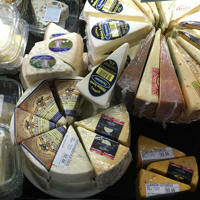 Choose from a variety of imported artisan and farmhouse cheeses. The selections range from areas in Switzerland to Wisconsin, The Co-op even carries the ever popular local favorite Juustoa "Finnish Squeaky Cheese" (when eaten warmed, it squeaks. A favorite in the U.P. of Michigan - and especially among the Finns). Our unique choices are the very best in the area. An extensive selection of imported and domestic beers and wines, including many organic and locally made selections. 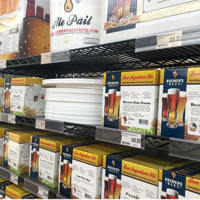 An abundant variety of supplies for the home brewer and winemaker are also available all year long. Non-alcoholic wines and beers are also available. Ask our expert Beer/Wine department manager about what cheeses pair best with the variety of wine you like best. A wide range of ecologically safe and cruelty-free health and body care products are available along with a large selection of Wellness products such as vitamins, supplements, homeopathic remedies and household cleaning supplies. Make intelligent choices for the dog and/or cat in your family. Choose diet products that have no artificial ingredients, preservatives, added color, or artificial flavorings. Selections of natural botanical shampoos and flea control, cat litter, supplements and best of all…TREATS! Shopping with a conscience doesn't have to stop with the family pet at the Co-op. The Co-op has a wide variety of unique gifts ideas for every occasion ethically and sustainably produced from around the world, including products from right here in the U.P. of Michigan. We have "tools of the trade" for the foodie in your life and supplies for the DIY-er in your family. Candles, canteens, winter wear and books to guide you through allergy-diet cooking, transitioning to local/whole-foods or vegetarian cooking, homesteading and healthy lifestyle choices.